One evening in April 2001, Lindsay Smith – then a Hollywood film producer and screenwriter – was puzzled by the sight of big red X’s drawn on the 26 ficus trees that canopied the street of her Gardena, California neighborhood. With a vague sense of worry, she hiked over early the next morning. Rounding the corner, Lindsay heard the sound of chain saws: Two large trees had been cut down to their stumps, and a crew of orange-vested workmen prepared to remove the rest. 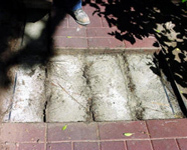 The reason, the foreman explained when Lindsay protested: the roots were breaking the sidewalks and the county couldn’t afford to keep replacing the concrete. The only known “remedy” was to remove the trees. Lindsay convinced the crew to wait while she called the county department responsible for the decision. The job was put on hold while she contacted dozens of nearby cities to learn how they dealt with their broken concrete sidewalks. Only one city had a solution: Santa Monica, California. 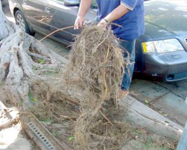 As Santa Monica’s Senior Public Works Inspector, Richard Valeriano spent considerable time dealing with concrete pavement broken by tree roots. One night in 1998, he had a strange dream: concrete sidewalks were rippling and undulating. Months later while at his health club, workers were laying rubber sports flooring and a light bulb went off: rubber for sidewalks. Unlike concrete, recycled tire rubber pavers could be modular, resilient, and unbreakable. In 2000, Santa Monica installed several pilot sites on a trial basis. Richard was excited to share Santa Monica’s experience with Lindsay. Lindsay in turn organized a presentation to share Richard’s rubber paver idea with all the cities she had spoken with. By the end of the meeting, several cities wanted product to solve their own sidewalk and tree problems. This motivated Lindsay to form a company that would sell these non-concrete modular sidewalks. The company was named for its namesake product: Rubbersidewalks, Inc. In keeping with its innovative spirit, in 2007 the company developed its next generation modular system: TERREWALKS®, made of 100% recycled plastics. Built upon the proven legacy of Rubbersidewalks™, TERREWALKS® looks like natural stone, is cost effective, light weight, and offers multiple environmental benefits. Today, the company has grown beyond the municipal market into commercial, military, and residential markets. With installations in more than 200 North American cities including Los Angeles, New York, Seattle, and Washington, D.C., our products are found in municipal and commercial sidewalks; corporate and university campuses; plazas, parks, green roofs, riverfront walkways, museums, residences, and other walkway applications. 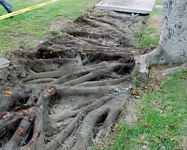 The original ‘Rubbersidewalks’ were installed next to large ficus trees. We assumed they would be lifted or bent by new root growth. which were easily and safely removed. Modularity had changed their behavior.